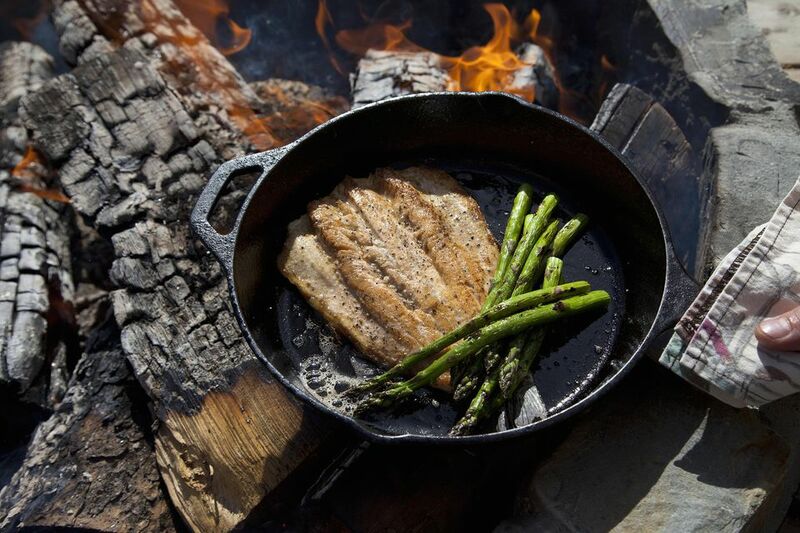 Cast iron is among the most popular cookware materials, in large part because it's versatile, durable and inexpensive. A cast iron skillet boasts no space-age alloys or multi-ply encapsulated construction—it's just solid iron, a substance so fundamental to human civilization they named an entire age after it. And yet for some reason, cast iron has a reputation for being difficult to take care of, right up there with orchids and tropical fish. In reality, nothing could be further from the truth. Cast iron is actually virtually indestructible. If you follow a few basic guidelines, your cast iron cookware should last the rest of your life. Let's break down the basics of caring for your cast iron cookware, and debunk a few myths while we're at it. With cast iron (and unlike everywhere else in the culinary arts), the word seasoning has nothing to do with salt and pepper. Instead, the term refers to a layer of oil that's been baked into the iron to form a permanent, impermeable coating that protects the iron from rust and helps prevent food from sticking. Most (but not all) cast iron cookware comes preseasoned, and that's the kind you should get. Yes, you can buy unseasoned cast iron cookware that you have to season yourself. You could also buy solid iron ingots and try to forge your own pan. But don't. And don't buy unseasoned cast iron pans, either. The idea that a newbie home cook could do a better job of seasoning a new cast iron pan than the actual manufacturer of said pan is one of the many peculiar notions about cast iron that has cropped up over the years, and one that should be dismissed. Another common misconception is that seasoning consists of a layer of oil that somehow "soaks into" the iron. The process of seasoning does begin with oil, but seasoning itself isn't oil, nor does the iron absorb oil. Instead, what happens is that a thin layer of oil (usually unsaturated oil like flaxseed, grapeseed or canola) applied to the pan and then heated to between 400 and 500 F undergoes a process called polymerization, which means that the oil turns into a hard, impermeable coating similar to plastic. Meanwhile, the carbon atoms that help make up the fat molecules latch onto the iron, causing this hardened coating to molecularly bond to the surface of the pan. This smooth, black coating cannot be wiped off or washed off, and can be scraped off only with deliberate, determined and relentless effort. Note, too, that seasoning is not something you do to a pan all at once and then it's done. Rather, it's something that happens to a pan, a little at a time over the life of the pan. Every time you cook, the fat in your burgers, steaks, chicken or whatever heats up and adds a bit more to that layer of seasoning—provided it is heated high enough. Given what we've just discussed, it should be clear by now that soap and a scrub brush are not going to ruin the seasoning on your cast iron skillet, which is yet another common misconception. Instead, what happens if you never wash your skillet is that grease builds up on the surface and eventually becomes rancid. No amount of dry paper towels or scrubbing it with Kosher salt is going to get the surface of that pan properly clean. The truth is that soap and water is a must for cleaning your cast iron. But whatever you do, don't let it soak in the sink, and for heaven's sake, don't put in the dishwasher. It'd probably break the rack before you got that far, but still. Just wash it in the normal way, by hand, with regular dish soap and a brush or a sponge. How you dry it is a much more critical factor. In theory, a good seasoning will prevent rust since it repels water. Even so, it's a good idea to dry your pan well with a dish cloth and then heat it on the stovetop to evaporate any last traces of moisture. You can then rub a bit of oil on it before putting it away—more as a form of rust prevention than as an attempt at seasoning. However: Unlike washing, scrubbing or scraping, one of the few things that can cause your seasoning to deteriorate is acid. That means simmering acidic sauces like tomato sauce, deglazing with wine and so on are not the best things for your cast iron cookware. If you should find that the seasoning on your cast iron pan has gone a bit patchy, there is no cause for alarm. Some cast iron enthusiasts would have you reaching for the rubber gloves, garbage bags and oven cleaner to strip off the old seasoning and start over. Don't do this! Instead, just keep using the pan, and remember to dry it thoroughly after every use. If rubbing it with oil makes you feel better, then do so. It will prevent rust if nothing else. But the best way to heal the seasoning on a cast iron pan is to continue cooking with it, especially at temperatures between 400 and 500 F where the fats in your food will undergo polymerization and carbon bonding.